Deputies take Takiyah Thompson into custody Tuesday. DURHAM, North Carolina -- Durham County sheriff's deputies arrested a woman who said she took part in toppling the Confederate statue in downtown Durham. Takiyah Thompson, 22, was taken into custody shortly after protesters held a news conference Tuesday afternoon at North Carolina Central University. Durham County officials called for a "respectful and productive" dialogue on race issues Tuesday following the destruction of a Confederate monument outside the old courthouse in downtown Durham. * Sheriff will charge protester to "full extent of the law"
At a news conference, Durham County manager Wendell Davis called pulling the statue down "unlawful and inappropriate." As the state has a law mandating the protection of Confederate monuments, Davis said county officials will be consulting with state officials about what to do with the heavily damaged monument. The statue was pulled down by a group of demonstrators Monday evening. A woman climbed a ladder and put a nylon rope around it while others pulled. 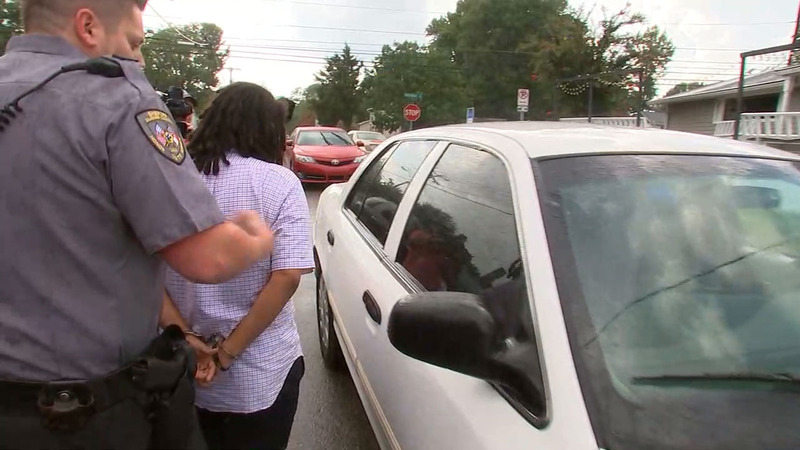 The woman, who identified herself as 22-year-old Takiyah Thompson in an interview with ABC11 Tuesday, said she is a member of the Workers World Party and admitted her involvement. "I feel like it's important to tear down these vestiges of white supremacy," Thompson. Also at Tuesday's news conference, Durham County Sheriff Mike Andrews addressed criticism that his officers did not intervene as the statue was pulled down. He said using pepper spray was considered, but leaders decided on restraint to avoid injuries and further chaos. "Don't mistake restraint for inaction. If I had my deputies to engage a hostile crowd, there would have been injuries," he said. He also said people seen in the video will be arrested. "Last night we witnessed a blatant violation of the law. No one is getting away with damaging the Confederate statue. We will pursue felony charges," he said. The statue is one of dozens across North Carolina and one of about 1,500 public displays across the country dedicated to the Confederacy.